Movie goers may remember the hard-hitting portrayal of the Vietnam War that is the 1987 film, “Full Metal Jacket”. What they may not remember is the story of the film’s door gunner portrayed by Tim Colceeri. That’s probably because it was a lost tale until recently. Colceri is now the star of his own comedy show, “Get Some!”, and it is hitting the stage of the London Bridge Convention center this weekend. Be prepared for an evening of laughs, gasps, tears, (and even hope). The audience will get to hear the untold story of opportunity lost, the insanity of working with director Stanley Kubrick, and first-hand experience as a United States Marine. The big kicker of the “Get Some! 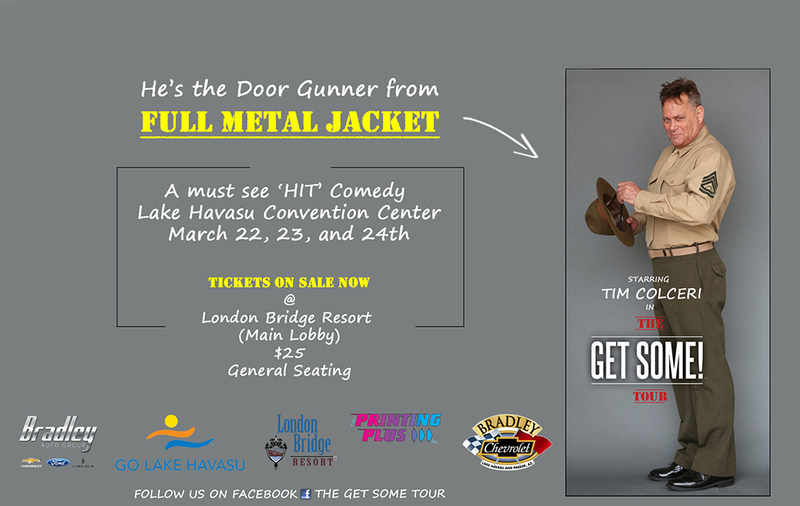 Comedy Tour” is how Tim Colceri was originally meant to play the role of the infamous Drill Sgt. The iconic role was later given to R. Lee Ermey. The show is the directorial vision of fellow Full Metal Jacket star, Kevyn Major Howard. In the war film, Howard played Rafterman. Once the film ended, Howard continued to play supporting roles alongside actors such as Clint Eastwood, Charles Bronson and Frank Sinatra. “[Tim Colceri] makes people in uniform have tears rolling down their face from laughing so hard with his ability to tell his ‘Robin Williams’ animated-style story. He is himself telling the story of his life,” Howard said. Along with his directorial breakthrough with the show, he also finds purpose in his societal contributions. He is the founder of the nonprofit Fueled by the Fallen. Through this organization, Howard helps families of military and first-responder personnel in times of need. After being awestruck by a monument of a fallen marine located at the 29 Palms base in California, he was inspired to honor all of those fallen in service. To do so, he found a universal interest among all demographics – automotive. He developed vehicles that display more than 800 names – each of those fallen in Air Force, Marines, Army, Navy and law enforcement. His most recent series is a five-car group called the 9/11 Angels. Each car commemorates those fallen from the attack including both Trade towers, first responders, the Pentagon and Flight 93 victims. The two Trade Tower and Pentagon vehicles will be shown outside the London Bridge Convention Center during the comedy show. For more information on Fueled by the Fallen, CLICK HERE! “Get Some! Comedy Tour” is Friday and Saturday, from 7 to 9 p.m. There will be a matinee showing on Sunday at 2 p.m. For more information regarding the tour, follow them on Facebook, Get Some! Comedy Tour. Tickets are available for purchase at the London Bridge Resort. Tickets are priced at $25 for general seating. For more information on times, location, and ticket purchasing, please call London Bridge Resort: 928-855-0888.